It's been a while since I've written an "off-topic" post on here to talk about my impressions of a different MMO. In the past there's been Star Trek Online, Neverwinter (twice, until it graduated to its own blog), and the Elder Scrolls Online beta. 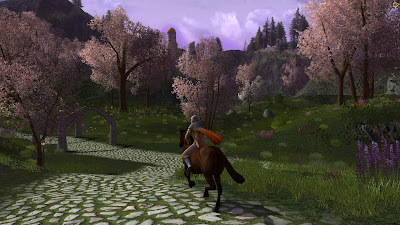 I guess it was about time I expanded my horizons once more, this time in the form of writing about trying out Lord of the Rings Online. It's a game that several of my blogger friends play and/or think highly of, so I've certainly thought about trying it before, but in the end I've never felt motivated enough to dedicate any of my limited free time to actually doing so. 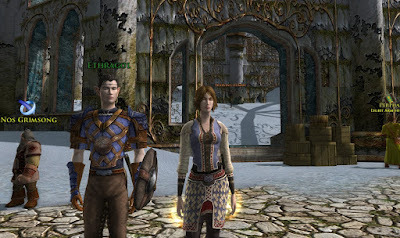 What changed recently was that my pet tank and I were talking about what other games we could possibly play together - which is actually always a tricky subject as we have somewhat different tastes - and it somehow turned out that we both had an interest in LOTRO. Unsurprisingly, we were both off to install it shortly afterwards. For me, that was already the first challenge, as the download kept failing at certain points. Fortunately I quickly found a forum thread detailing a workaround - the issue was caused by my particular combination of operating system and antivirus software apparently. On start-up, the game didn't give the best first impression to be honest. It showed its age by launching in a tiny resolution with terrible graphic settings which I wasn't allowed to change until after character creation, and similarly the theme tune (which is lovely, don't get me wrong) was blasting into my ears at a ridiculous volume by default. I let my pet tank pick what race we were going to be, so we ended up as elves. Much has been said about the supposed ugliness of LOTRO's character models, but I honestly didn't find them that bad. They could just do with better facial expressions. My own elf for example looks perpetually bored out of her skull for some reason. I guess this is lore-appropriate ("So tired of Middle-earth... must leave it...") but not very appealing. Speaking of lore, I should probably say up front that I'm not a Tolkien superfan. I did have a love affair with Lord of the Rings back in high school, when I chose it as the subject of my final English paper, and I also liked the films well enough when they came out (in fact, I had a giant poster for each one in my bedroom at the time). But I gave up on the Silmarillion about a third of the way in because I felt that it read like a particularly boring history textbook, and when I tried to watch the first Hobbit film in the cinema I actually literally fell asleep at one point. So I apologise in advance for maybe not understanding things or getting any lore wrong. Anyway, the game starts you off in a short solo instance that teaches you the most basic of MMO rules, such as how to talk to NPCs and fight enemies, but that was done quickly enough and I was able to join up with my pet tank. True to our favourite archetypes, he chose to roll a guardian tank and I opted for a minstrel healer, also in part because I've never actually gotten to play a bard-type class in an MMO before. It's absolutely hilarious. "Look at me, I'm playing music at things and they fall over dead!" "Wow, you're that bad at it?" Another very deadly attack simply has me shouting at monsters. The amusement value of that is just endless. The starter zone gave off strong vibes of an old game that doesn't see much fresh blood anymore, as we were on our own for most of it, only running into one other player at the very end. We did see a couple more people once we moved on to the next area though, so maybe it's just another instancing thing. One mechanic I found very interesting from the start is how loot works. Basically, you don't need to click on the bodies, things just go into a sort of "temporary bag" automatically, from which you can then claim them whenever it's convenient for you (as long as it's within the hour). This is simultaneously very convenient and made me feel kind of robbed, as in every other MMO I've played I usually have a reputation for "chasing after the shinies" and annoying other people by triggering loot-roll prompts in the middle of combat. In LOTRO, that's just not a thing, and it's easy to forget that you're picking up any loot at all. At one point I picked up something like ten (temporary) copies of what was supposed to be a unique quest-starting item because I didn't notice that it was there and the game just kept throwing more at me in an attempt to make me use it already. This initially lulled me into a false sense of security in terms of bag space, making me think that it would not be a problem, but this turned out to be very wrong very quickly. LOTRO basically does the same thing Neverwinter does to sell bags, which is to fill your bags with loads of stuff that isn't quite crap, but leaves the new player uncertain of what to do. You know that none of it is very valuable, but you're not really sure if it's safe to throw it all away or if you'll just end up regretting that later. I sold a whole load of stuff that I was sure was nothing but vendor trash, just to find out later that there were repeatable quests where those same items could have been handed in for reputation. Conversely, I held on to various crafting materials for a really long time (at least those go into their own separate tab in Neverwinter! ), hoping to be able to sell them to other players instead of vendoring them, but then had to learn that free players are not allowed to list things on the auction house. Anyway, back to the game itself. The questing is very old-school, with your character being sent from one mini-hub to the next, where there are usually a bunch of similarly-themed quests to kill X number of mobs, but I can't say that we've minded that so far. My pet tank and I have mostly been pleased that we haven't encountered any issues with doing quests as a group up until now, whether they involve picking up items, talking to an NPC or doing a short little instance. You'd think that ensuring a smooth experience for people playing together would be a given in any MMO these days, but unfortunately I've had to learn not to take that for granted, so LOTRO definitely gets points for that. Every now and then there is also a little cut scene, which I'm sure must have seemed amazing back in 2007. One overall impression that's very strong however is that the game is very confusing. Considering I seem to remember LOTRO being cited as a pioneer of quest tracking, it doesn't do a very good job at showing you where you need to go, and the maps are only available in a very zoomed out view that makes them hard to read. The game also absolutely bombards you with information about systems and mechanics early on. By level ten we'd already been told about traits (talents), reputation, crafting, deeds, cosmetic gear, dyes and how to use the store, and my minstrel already had more than one action bar full of abilities. There was probably even more stuff that I'm forgetting right now, and it's telling that even as an MMO vet of more than ten years I've been struggling to keep up. It's certainly helped a lot that I've picked up vague references to certain systems from reading other people's blogs about the game. I can only imagine how overwhelming the experience must be for genuinely new players; the game could really do with spacing some of those things out a bit. Also, timing matters! I had to laugh at the sheer absurdity of the game popping up a big window full of text for me to read when we accidentally triggered a fellowship combo for the first time, something to which I was supposed to react within seconds without ever having seen one before. Who has time to read a tutorial at that point? Overall, my impression of the first couple of levels has been a somewhat mixed bag. There is a lot to love about LOTRO. The zones look every bit as gorgeous as everyone always says, even in 2017. I could see the gameplay maybe being a bit boring when you're on your own, but in a group it has been very fun. The world is an explorer's dream, and the lore runs deep. But the game's age and sheer amount of systems can give you quite a hard time as a new player. F2P restrictions also keep popping up in odd places. (Hey, check out the wardrobe! No, you're not allowed to use it!) If we do decide to keep adventuring in Middle-earth, I'll probably pony up for a month's subscription - it's only fair. If that happens, I'll likely also make another post about later impressions at some point. LOTRO-playing friends, feel free to share any tips and advice you'd give to a new player! Also, what's the situation with group content while levelling up? Are traditional levelling dungeons still a thing? I've kind of been struggling to find information on that but keep thinking that it would probably be fun for my pet tank and me to be able to test our tanking and healing skills in a real group environment soon. LOADS of games have blasting sound when they launch nowadays. Sadly, that's not a rare occurrence. Also, I never would have pegged you as a loot-roll troll! I don't consider it trolling! I'm not talking about old-school stuff like looting the boss before the fight is even over. The problem is that nowadays many of the people I play with don't even have any interest in anything that isn't boss loot, so in SWTOR for example they will mock me for running off to the side to loot that one trash mob who got knocked back. In Neverwinter the problem is that random gear drops are so numerous and worthless that there's a whole culture of not even bothering to click on the sparkly stuff on the ground. I can't resist the shinies however, so people get annoyed with me causing loot windows to cover up most of their screen and having to go through the hardship of hitting "pass". OK, that makes more sense. Is there gonna be another stop for the "off-topic" train? Probably at some point, but I don't really plan these things, so I don't know when! LotRO is a game which I have had a bit of a history with myself. I can't remember how I first heard of it back in 2012, but regardless my time with the game was brief; I still suffered from extreme "MMO-Newness" so I found myself being extremely lost and eventually leaving my Guardian at roughly level 23 when this being lost proved detrimental to his gear and eventually possible quests. Plus, horse-acquisition got on my nerves somewhat. Roll on to 2015, and I try again. Same account, different server, different class. Having learned by this stage that I was more of a Ranged DPS than Melee Tank, I rolled Hunter, and found myself actually enjoying what the game had to offer at long last (although the relative but-now-experienced pain to acquire a horse still stung rather sore). What killed 2015's attempt was getting too far ahead of the game. I started doing Skirmishes - basically mini-dungeons which can be done even by one person - for the easily-accessible gear within. This unfortunately became too regular; I had completely out-levelled all of my actual quests in an attempt to familiarise myself with my class whilst simultaneously getting good on-level gear. I do find it rather frustrating that I haven't been able to get much of a foothold within LotRO because I do firmly believe that in many ways it fits the MMO-genre much more than SWtOR does; vast lore to extract class and race details from, rich environment for locations, and of course it suits the "evil orc" genre more than any other game. The social side has also always been something I loved; the fact that every character has passive instrument proficiency is particularly fantastic, and of course opens up the possibility of seeing player bands take root outside the Prancing Pony or in the Shire and play either their own compositions or a simplistic rendition of a famous piece of music. I have returned to it again in 2017 (and again playing Hunter although I did briefly consider Champion...) , and I also found myself surprised by the in-game store. It never used to be browser-based, and operated much like the Cartel and Zen Markets. I don't know if that's something which Standing Stone Games have done since acquiring the game from Turbine or whether Turbine introduced that themselves after I left again in 2015. If there's one thing I truly dislike about LOTRO, it's the maps. They are terrible to find out where you need to go. The rings often blend into the background, which is easily remedied by simply changing the ring colors, but for some reason that becomes something the player has to take care of. Clean up the maps --basically making them better colors to read-- and you've solved my biggest issue with LOTRO. Are you saying you can change the colour of the quest trackers on the map? Where can you do that? You might have already found it by now, but on the mission tracker on the map there are little coloured boxes by the quest names. Clicking on these bring up roughly ten different preset colours to choose from, and voíla! Welcome to Middle Earth! I've never experienced the full force of the store as I'm a lifetime subscriber. Regardless I do find the world endlessly charming, and I rather like the crafting system in this game as well. Minstrel and Warden are both very interesting classes thematically and gameplay-wise. That said I've mostly played Champion in LOTRO, very unusual for me as I was never a fan of melee DPS in other games. If you're worried about out-leveling stuff you can either buy the 'tortoise' pocket item from the store that toggles of XP gain while equipped or at least vendor all the trash items that were repurposed as repeatable XP bounty-style hand-ins via the task boards. The one thing that has annoyed me about the crafting somewhat is that it gives you this set of three different skills that are supposed to be complementary, but tinkering (my choice) for example includes cooking, which I've been completely unable to level so far because it requires materials from farming (which is not included in the tinkering set). From the looks of it, the only way to get anywhere with this will be to either make a farming alt or to buy the ingredients from someone else on the auction house. Very informative post. I have been avoiding LotRO because of perceived inadequacies of it being outdated, especially in the graphics department. Your post inspired me to give it a try. But, something is broken for me (or I am just doing it wrong?). I downloaded the game, tried for hours to create an account, discovered I had somehow previously created an account and forgotten about it, and eventually got my password reset after figuring out what my login name was. Then, I tried to log in and was presented with an error message that I couldn't log in because I don't have a subscription. I thought it was free to play? Or is it buy to play? Do I have to purchase the game before I can play subscription-free? And, speaking of buy to play, I also checked out your older post on Elder Scrolls Online again. As I have a friend playing it, I have been doing major research on it recently and I am not in a position to spend nearly $50 on a game that I may enjoy, especially when SWTOR is really fulfilling all my gaming needs right now! Quite a few things have changed since you tried it. Its pricing model, apart from the up front purchase is very similar to SWTOR's, with the optional monthly subscription mostly just offering coins for the cash shop, accelerated XP, unrestricted access to certain "endgame" content, and free access to the paid expansions. Player housing was also introduced. The biggest recent change is "One Tamriel", which is their version of bolster/level-scaling, which also allows cross-faction play and is "always on", so you can explore any area (including other factions's starting zones and high level areas right from level one (although players recommend that you avoid the dedicated world PvP areas until you are higher level and have access to more abilities). The leveling system is also interesting (I think this is a recent change too). Apart from character level, each skill tree also levels up (by having abilities from them in your action bar or weapons or armor pieces equipped) and new abilities unlock based on the level of the skill tree rather than your character level (increasing your character level provides skill points for purchasing said new abilities unlocked by leveling your skill trees). And then they have "veteran ranks" after you reach max level. Not entirely sure what their purpose is (but I believe they also grant new skill points). I really want to try it out, but I am waiting for the next free weekend event (which seems to happen quite unpredictably; I just missed the last one, in April) or my end of year bonus to maybe buy it (sadly, my local currency is very weak against the Dollar, so $50 is about R750 in my local currency *sad face*, hence the deep investigation before commuting to a purchase like this). LOTRO is indeed free to play, but it seems that error is a relatively well-known issue. A quick Google search revealed that logging in through this page before trying to log into the game itself might help. I actually ended up purchasing a copy of ESO at some point once the price had dropped a lot. Then it gathered dust on a chair for a year or two. Recently I actually bothered to install it (and was surprised to find that I got some sort of monkey pet as a reward for having been in the beta) but I was disappointed to see that the dreary tutorial was still the same as it was. (I thought I had read somewhere that they allow you to skip it these days.) I made it through that but then somehow just haven't had any urge to log in again. I'm guessing I'll get back to it at some point. Thanks. I will try that when I get home this evening. I am hoping that there will be another free weekend before I am faced with the choice of whether to buy it or not. I have a feeling (or maybe it's just hope) that they may follow the path that other buy to play games (like Guild Wars 2) have in the past and make the base game free when the first "major expansion" (Morrowind) releases in June / July. That would please me, but likely irk those who actually spent money on the base game, a thoroughly unpleasant experience I myself had with Guild Wars 2. I remember watching a live stream recently where the guy was doing a play-through of ESO. He also said the introduction was skippable, but didn't go into how. I was under the impression that there is a helpful pop up which asks if you want to play it or not.